My husband usually bought me this soup pouch so that I can carry with me at work. I love the lentils flavour, it taste so good. Heinz soups are terrific and I bought a large stash of Soup of the Day pouches when they were on special. I have been so delighted with this range as they have good body and good taste too. Tomato and Vegetable Lentil soup is sensational to taste. This is a great soup – which not only tastes great, but comes in a really hand pouch that you can microwave – thus you can take it to work. Watch the hot pouch though. This is a delicious soup satchel that heats easily in 2 minutes and is perfect for work lunches. This range of soups is the closest I’ve hound to homemade in flavour and texture. Not as expensive as some brands and full of real veg. This flavour is a real winter warmer. 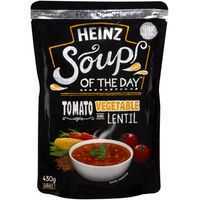 How would you rate Heinz Soup Of The Day Soup Pouch Tomato, Vegetable & Lentil?